Back to the Future Piano !? Every once in awhile, we take a look at some things in the past and think that they are actually from the future. In fact, we would have probably not realised that it was from the past if there was no information given. 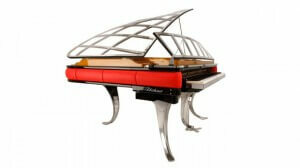 Well the Tuvie piano from Poul Henningsen Grand Piano is one such example. Just take a look at the image below and be the judge yourself. This unique and conventional grand piano was actually designed in 1931, yet its deceiving looks is capable of making it come off as a futuristic looking piano. So how exactly was Poul Henningsen able to come up with such a intricate design during that period of time? Well, the design was actually a response to conversation that he had with Leo Mathiesen, a famous Danish Jazz pianist. Leo told Poul about the difficulty he was experiencing with the solid lid of his piano. He mentioned that the opaque wooden piano lid was making it hard for him to see his bass player during his performances on stage. This prompted Poul to create a light and open design to overcome the problem. In fact, the whole design of the piano, including the curved legs, is to enable more room for percussion instruments in an ensemble set-up. As for the music desk, it was creatively molded to match with the lid as a single transparent shell. Although there were some critics about the practicality of Poul’s piano design, it is still undeniably one of the most innovative and beautiful pianos to be ever created, especially doing that time. For more information about the design of the piano, do check out here. At Awesome Piano, we do offer Piano Rental and Sales to our students in Singapore. However, please do take note that our designs are more to the traditional and commonly seen ones. It is definitely nothing close to Poul’s. Nonetheless, you can be assured that they are in proper working condition for you to practice on. We believe that our concept of piano rental is most suitable and useful for individuals who aren’t yet ready to commit in buying a piano. We are aware that the price of a piano isn’t cheap. Hence, we have come up with this rental scheme to assist you. The best part of it all is that if you do decide to buy the piano, you would just have to pay the remaining amount after deducting the accumulated rental fees that you have paid.